I'm not usually a fan of thematic manicures but I loved 'The New Girl' actress Zooey Deschanel teaming her red silk taffeta Oscar de la Renta gown and Kwiat jewellery with her quirky retro film strip nail art at this weekend's Golden Globes. ADORKABLE. This week I went to the Natural History Museum to see my favourite annual show: the Veolia Environment Wildlife Photographer of the Year exhibition. Selected from 48,000 thousand international entries the 100 winning images of exotic, slippery, playful, dangerous and adorable wild creatures are displayed beautifully. The environmental section, focused on mankind's frequently callous attitude towards the wildlife around them, is particularly affecting. ‘Primal Fear’ by Jabruson (left) which shows a Mozambiquan boy holding a completely terrified monkey captive is still haunting me - exactly it's intention. 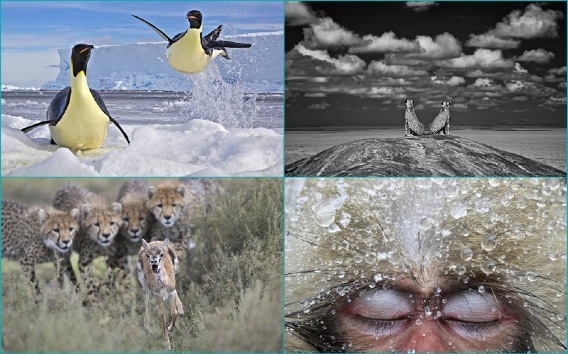 This exhibition serves as an important reminder of how spectacular the animals on our ever-changing planet really are, whilst also showing off the huge respect, concern and insane talent that these intrepid photographers that capture their images possess. The Veolia Environnement Wildlife Photographer of the Year exhibition is on display at the Natural History Museum and runs until 3 March. Admission is £10. The Name's Bond Street. James Bond Street. The song is taken from Ren's intensely emotional debut album, 'Through the Night.' Super beautiful ladies, super beautiful song. I loooove. ... it’s many hundred miles, but it won’t be long." Hawt = A late 1940's and early 1950's acronym for "Having A Wonderful Time." Now the word is used on the internet as slang for something reeeeally hot. Poppy Delevigne arrived to take her seat on the Louis Vuitton SS’13 FROW on the final day of Paris Fashion Week looking très chic. The model wore a beautiful midnight blue pleated chiffon dress from the Louis Vuitton Cruise 2013 collection accessorised with the label’s navy blue perspex heels. Some red lipstick and a poppy red Louis Vuitton Speedy Bandoulière Monogram Empreinte bag added some colour to her look, and the shape of the bag made this outfit far more appropriate for the daytime than if she had chosen a clutch. Ooh la la. Très bien Poppy! Keren Craid and Georgina Chapman delivered the Indian Summer I had been praying for with their stunning collection of beaded gowns with sari style layering. Although the Marchesa designers used a vivid colour palette (fuchsia and garnet featured) it was the shimmering white gowns with their sparkling bodice detailing that had me entranced. This morning Rosie Huntington-Whiteley officially launched her much anticipated ‘Rosie for Autograph’ lingerie range at the M&S flagship store in Marble Arch. The 33-piece range of underwear features luxe lingerie sets, a teddy and a beautiful silk kimono, and with their rose-prints and art deco inspired detailing, the collection has a very 1930s boudoir look to them – the Devon-born supermodel’s favourite era of fashion. Rosie said: 'M&S is an iconic British brand, adored by many so I'm very excited to be launching my debut lingerie line with them.' The stunning collection is available in store today and online here.